I stopped in to say hi to the people at the Port of Tacoma yesterday before I visited Safe Boats International’s new facility. 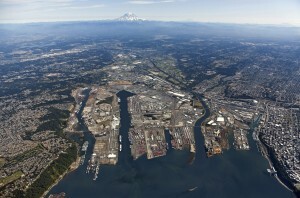 They have me this aerial, taken this past September, of the port. The port has four peninsulas that extend west in to Commencement Bay. To the north Brown’s Point overlooks the port. To the south, downtown Tacoma is right there. In the photo, Safe Boats is on the left-hand peninsula, the one with the docks. The facility is right at the end, between the two white buildings.